Horsham will have the luxury of watching the final week of the season and gripping play-off battle unfold while they put their feet up. Due to Thamesmead Town folding this season, the Hornets will not have a game on the final day of the Bostik League South East season. 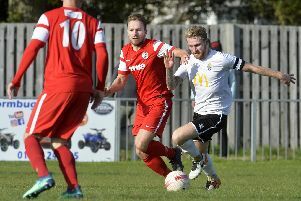 They were due to play the former Dartford-based outfit on September 27, but with that fixture now cancelled, their final game will be in Guernsey on Easter Monday. That will mean in a rare turn of events, Horsham can watch the final week of the play-off race unfold knowing they have done all they can. With six games left to play, they sit second in the league. Of those that make up the current play-off standings, they are one point ahead of Ashford United, two ahead of Hastings United and three ahead of Haywards Heath Town. It now looks like a closed race with sixth-placed Hythe Town having to make up 11 points on Haywards Heath. 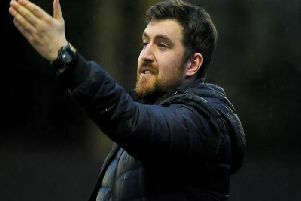 Dominic Di Paola’s side host third-placed Ashford United on Saturday and the manager is still stressing to his side to keep their feet firmly on the ground. He said: “It’s Ashford this coming Saturday and I have said it a hundred times this season, there is no easy game. We have just got to keep going. “If I am honest, I do not even know how many points we are on. It’s all at the back of my mind and the focus is on each game and not getting too excited. If you start thinking about the end before you get there, you can end up not achieving what you should achieve. “We do not have a game on the final Saturday as we were due to play Thamesmead, so it could go down to the wire and we could not end up knowing the play-off outcome until that final Saturday. “It’s different. We play on the Monday and then have no game and do not play when everyone else has their last game of the season. It’s a bit odd, but just the way the fixtures have fallen. Injury wise, Lewis Hyde is not far away from fitness and could return to match action against Ashford. Will Miles is a couple of weeks away from a return with his hamstring injury, while Dean Pearse has two games left of his suspension to serve.